A city in eastern China has become the first to attempt to ban internet "manhunts" which aim to put pressure on corrupt officials. Lawmakers in Xuzhou have passed a law which makes it illegal to post "private information" about individuals online. It is being seen as evidence of the concern officials have about blogs and internet forums that criticise the authorities and state institutions. 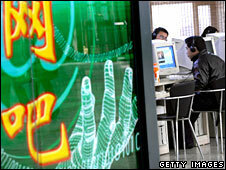 Internet users have attacked the new law; a poll found 90% oppose it. City authorities say they will fine people more than $700 (£500), and ban them from using the internet for six months if they post "private information" online. In China, when an individual is suspected of doing something wrong, people post information about them online and ask others to find out more. This is known here as a "human flesh search", and is a form of vigilante justice. Those whose details are made public in this way often get bombarded with abusive messages or harassed. It sounds cruel; after all, these are not people who have been convicted of any crime. But many Chinese believe they are an effective way to keep corrupt officials in check in a country where it is hard to find other means hold them to account legally. Last month an official in Jiangsu province was sacked after pictures of him with what appeared to be a valuable watch and an expensive pack of cigarettes, both judged to be too pricey for a civil servant, were uploaded onto the internet. The posting prompted a vigorous campaign against him online which led to his dismissal.